Here we have it, folks! On Sunday, May 11, 2014 the two-hour season finale of season three will air at 8 p.m. ET. From 8 p.m. ET, we first see Snow Drifts. From 9 p.m. ET, we start No Place Like Home. 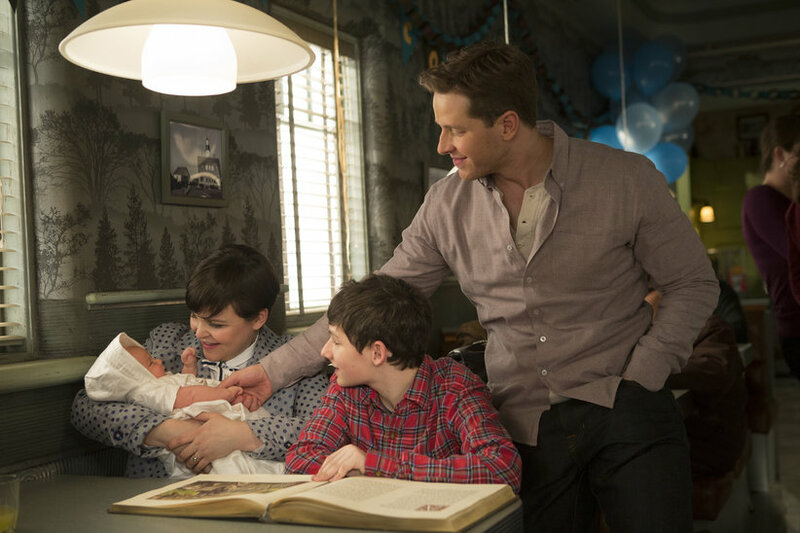 The finale kicks off with the celebration of Mary Margaret and David’s new baby boy. The Storybrooke residents gather in Granny’s Diner for a coronation to name their child. However, during this joyous time, Emma and Hook are pulled into a portal. The portal that Zelena opened during her time travel curse. This portal takes Emma and Hook in the Enchanted Forest of the past. During this adventure, they do learn that there is a way back. However, they cannot touch or alter anything. If they make one slip-up, this could risk the lives of their friends and family. It could even threaten their very own existence. A few weeks ago, we did learn there was going to be a wedding. However, we still have no word on who will be wed. Who do you think will tie the knot? Guest starring in Snow Drifts are Lee Arenberg as Leroy/Grumpy, Anastasia Griffith as Abigail/Kathryn, Tony Amendola as Geppetto, Meghan Ory as Ruby/Red, Alex Zahara as King Midas, Beverley Elliott as Granny, Rebecca Mader as Zelena, David-Paul Grove as Doc, Gabe Khouth as Sneezy, Faustino Di Bauda as Sleepy, Sean Maguire as Robin Hood, Christopher Gauthier as Smee and Charles Mesure as Black Beard. Guest starring in There’s No Place Like Home are Lee Arenberg as Leroy/Grumpy, Keegan Connor-Tracy as Blue Fairy/Mother Superior, Meghan Ory as Ruby/Red, Raphael Sbarge as Archie Hopper/Jiminy Cricket, Beverley Elliott as Granny, Sarah Bolger as Aurora, David-Paul Grove as Doc, Gabe Khouth as Sneezy, Faustino Di Bauda as Sleepy, Jeffrey Kaiser as Dopey, Mig Macario as Bashful, Sean Maguire as Robin Hood, Eric Keenleyside as Sir Maurice/Moe French and Raphael Alejandro as Roland.